This molecule has an X-ray structure reported, as a means of confirming the stereochemistry at the various centres, and particularly at the carbons bearing a cyano group. Labelled as compound 22 in the publication, there is no discussion or follow-up on the resulting conformation of this compound, which in fact adopts one with both cyano groups axial (there are three other possibilities of course, in which the cyano groups can be both equatorial, or one axial and the other equatorial). 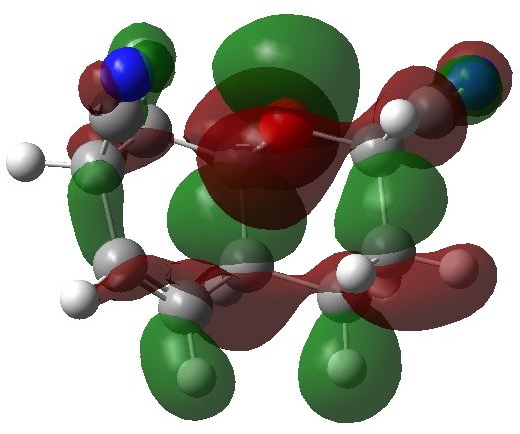 A B3LYP/6-31G(d,p) calculation of these conformations confirms that the di-axial isomer is indeed the most stable (see for example DOI: 10042/to-2402 for a digital repository entry for the calculation). An inspection of the molecular orbitals for the di-axial isomer reveals that the HOMO involves interaction of the alkene π-MO with the C…CN bond (top) and the HOMO-1 involves interaction of the oxygen lone pair with the C…CN bond (bottom). This sort of interaction is a classical anomeric effect! So what is unusual about it? Well, anomeric effects are normally described in text books and lecture courses as involving predominantly oxygen (and nitrogen) as an electron pair donor, and C…O (and C…N and C…F) σ-bonds as the acceptors. The stereoelectronic alignment of course has to be anti-periplanar, and this orientation will control how the anomeric effect operates. What you may not find in the text books is a C…CN bond as the electron acceptor! But if e.g. C…F can be one, why not C…CN (the cyano group is often described as a pseudo-halogen). 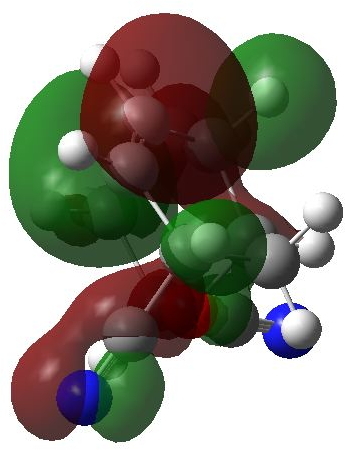 If you inspect the 3D model above, you can see that the C…CN bond associated with the adjacent oxygen is perfectly set up for anti-periplanar alignment with one of the oxygen lone pairs (an arrangement not possible if the CN group had been equatorial). The C…CN bond length (1.49 Å) is indeed about 0.02Å longer than one would normally expect of such a bond. Inspection of the HOMO shows an almost identical interaction between the C…CN bond and the alkene, implying that here it is the electrons from an alkene that are the donor. This combination, of an alkene as donor and a C…CN group as an acceptor has (to my knowledge) never been suggested as an anomeric effect pair. It is not as strong as before (C…CN 1.47Å) and perhaps in this case, it adopts the axial position because the alternative equatorial conformation is disfavoured for other reasons. But, and this is the point of this blog, the structure of compound 22 in the synthesis project above has some interesting aspects, which perhaps can lead to new insights and even new chemistry. One can but wonder how many reported compounds have properties which are perhaps more interesting than their authors realize, and how much new chemistry is lurking in the literature which has not (yet) been noticed. With more than 50,000,000 compounds now reported in Chemical Abstracts, there is surely lots out there to discover. However, will it be humans who will increasingly do so in the future, or automatons scouring the Semantic Web? But here we digress to a new topic! This entry was posted on Friday, September 18th, 2009 at 9:50 am and is filed under Chemical IT, Interesting chemistry. You can follow any responses to this entry through the RSS 2.0 feed. You can leave a response, or trackback from your own site. It is a great post. Anomeric effects report and X-ray structure reported will be very intelligent reports. Another interesting twist is that the trans-decaline relative with cis-dicyano groups also reside in diaxial positions. Have a look at the crystal structure at Leibigs. Ann. 1994, 205.